TT: Henry VII, Worth Skipping? Looking for the Wednesday Wandering? Page back one for a few thoughts on how to gear up to write convincing villains. Then join me and Alan as we take a look not only at King Henry VII, but also why one writer (me!) thinks Shakespeare may have considered this particular Henry not good material for a play. Also, I’d like to invite you to join me tonight at UNM for a talk on “The Mythic Impulse: Why Fantasy Speaks to Our Souls.” Details are available on my Facebook page and under Appearances on my website. Now… Back to the Henries! JANE: We’re back to a king Shakespeare chose to skip. After everything we discussed regarding how Henry VII came to the throne – up to and including possibly sanctioning child murder – I find myself wondering if Shakespeare chose to skip Henry VII because he didn’t like him. ALAN: There are some things about Henry VII that would lend themselves well to drama, so I’m mildly surprised that Shakespeare ignored him. JANE: Me, too, although for another reason. Henry VII was the founder of the dynasty which was reigning in England at the time the Bard was writing, so I’d think Shakespeare would have enjoyed writing a play about him. Such a play would be certain to please his patrons. Is it possible that once Henry VII got on the throne he was simply boring? JANE: Go on…You provide the events. I’ll provide the possibilities for drama. ALAN: Henry took the throne by defeating Richard III at the Battle of Bosworth. He was the last person to take the English throne by force of arms (and, interestingly, Richard III was the last English king to die on the battlefield). Henry’s claim to the throne was rather tenuous – he was vaguely related to the Plantagenets through his mother, who was illegitimately descended from John of Gaunt. But there’s no arguing with success, and Henry had the biggest army. JANE: That seems more than “rather” tenuous. Can you remind me who John of Gaunt was? ALAN: John of Gaunt was the first Duke of Lancaster. Henry IV, Henry V and Henry VI were all descended (legitimately) from him, so Henry VII was keen to claim the same relationship. However, because Henry’s descent was illegitimate, and also because it was through the female line, his claim was regarded as dubious, and was much frowned upon. JANE: Also, I’ve encountered material that claims that, although Henry VII claimed to be Welsh, he was actually French. Is there any grounding for that? ALAN: No – I don’t think that holds water. Henry was part of a long established family on the Isle of Anglesey who claimed descent from the Welsh hero Cadwallader, a legendary Welsh (and possibly also British) king in the seventh century. Henry displayed Cadwallader’s standard, a red dragon, on his victory parade through London after the battle of Bosworth. JANE: That must have been both lovely and dramatic. ALAN: One of the first things Henry did was to strengthen his claim to the throne by marrying Elizabeth of York who was (here we go again) the daughter of Edward IV and niece of Richard III. The marriage united the houses of Lancaster and York, and therefore Henry symbolised it by adopting a family emblem known as the Tudor Rose. It depicts a red rose with a white rose at its centre. JANE: Okay… This is very good stuff. Unfortunately for the Bard, Shakespeare had already used much of it at the end of his play about Richard III. The groundlings would have been certain to throw rotting vegetables. 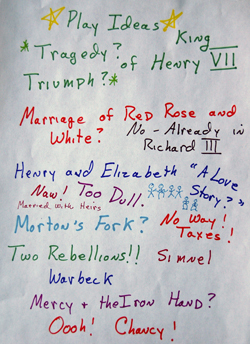 JANE: Hmm… This might make an element in a drama, especially if Henry’s courtiers were trying to force him to remarry. Any possibilities? Did Henry VII have an heir and a spare? They also had two daughters, Margaret and Mary. JANE: Darn! That ruins possibilities for the stage. Did Henry VII do anything with more dramatic potential? ALAN: The country was almost bankrupt and Henry desperately needed to increase his tax take, so as to bring the exchequer back into the black. He appointed Archbishop John Morton to the post of chancellor and charged him with this responsibility. Morton came up with a uniquely clever mechanism for collecting taxes. Any man living modestly within his means must obviously be saving money and could therefore afford to pay more tax. Additionally, any man living extravagantly must equally obviously be rich and could therefore afford to pay more tax. This reasoning was known as Morton’s Fork and was, not surprisingly, very controversial. Nevertheless it was applied ruthlessly. Nobody escaped the taxman and the treasury grew. JANE: Nice Catch 22 situation for the Crown, but lousy material for a dramatist. Neither Queen Elizabeth I nor King James I would have liked a play that reminded all levels of the audience that the founder of the Tudor dynasty was responsible for very creative tax increases. ALAN: The princes in the tower continued to haunt Henry. There were two Yorkist rebellions against him and both of them used figureheads to legitimise their claims. JANE (rubbing hands together): Ah! This has potential. Go on! ALAN: The first figurehead, Lambert Simnel, was originally intended to be presented as the younger of the two princes. However, the rather amateurish and inept conspirators later changed their minds and instead presented him as the Earl of Warwick, a cousin of the two princes. Henry defeated the rebels and Simnel himself was pardoned. Henry gave him a job as a spit turner in the royal kitchens. JANE: Hmm… Good on some levels, but dicey on others. Any reminder that not only Richard III but also Henry VII would have benefited from the deaths of the Princes in the Tower would have undermined all of Thomas More’s careful character assassination – as well as gutting the theme of one of Shakespeare’s most popular plays. Still, the mercy angle is good… Tell me about the second rebellion. ALAN: That was a much more serious affair. Perkin Warbeck claimed to be Richard, Duke of York, the younger of the two vanished princes, and raised an army on the basis of that claim. Again, Henry defeated the conspirators, but he was less merciful this time and Perkin Warbeck was hanged. JANE: Shoot! That would undo the mercy angle which would make Henry’s handling of the prior rebellion sympathetic. I’m beginning to understand why Shakespeare avoided writing a play about Henry VII. It’s also worth noting that, as his career progressed, Shakespeare did move away from historical dramas, focusing more on the tragedies and comedies and the later romances. Wait! Let’s save that for next time! This entry was posted on November 21, 2013 at 1:00 am and is filed under Thursday Tangents. You can follow any responses to this entry through the RSS 2.0 feed. You can leave a response, or trackback from your own site. I just watched the BBC/Starz 10 part mini-series, The White Queen, about this time period and read a lot about the War of Roses and Henry VII online. Richard III was by far a more tragic character. I wonder if Shakespeare was worried about a reprisal against him if he wrote about Henry VII? Richard III was hated by most of England, so he was a good choice for a play. After learning about what happened during the War of the Roses I now understand why George R.R. Martin took inspiration from this time period for his Song of Ice and Fire books. I think Shakespeare would have worried about reprisals — especially if he didn’t go a puff piece. There’s quite a bit of evidence (Tune in Next Week) that Shakespeare was very careful about what he said about the Tudor monarchs. It’s in 5 acts and mainly in blank verse. Thanks for the information…. I’ll need to look at this. Have you looked at my Henry vii yet? I put the latest version on my webpage last night. We had a play reading of it in the upstairs room a local pub the other day and it went down rather well. Alan did and told me he enjoyed it, but I’ve been snowed under. Thanks for the reminder!